In this project, Crafts students learn how to make masks. The following is a day by day guide of what we do in the classroom. 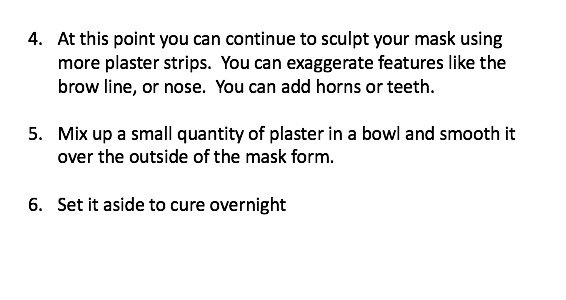 After this brief introduction, students begin researching masks using this worksheet. Then, they begin to design their masks. This is the end of the first day. Students should leave with a solid idea of what they want their mask to look like. Collect and grade the design worksheets. On day 2 and 3, students will begin to make their masks. First, we talk a bit about the Carnival of Venice and take some notes. On day 4, students stengthen their masks by applying more plaster strips, and then smooth it by adding a layer of plaster and then sanding it. We begin by learning about Lucha Libre.